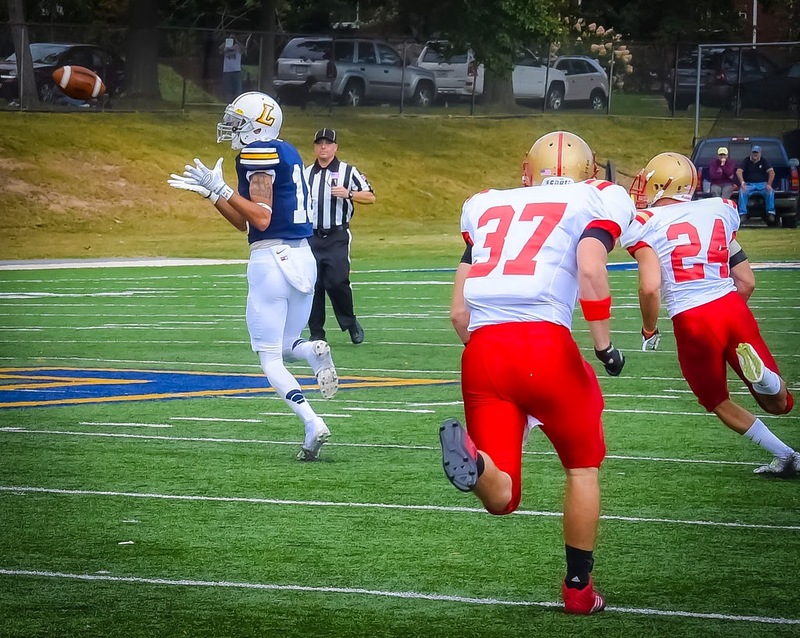 WILLIAMSPORT, Pa. – Another efficient performance, both offensively and defensively, helped the 23rd-ranked Lycoming College football team to a 28-13 win over King’s College in Middle Atlantic Conference action on Saturday, Sept. 20, at David Person Field. 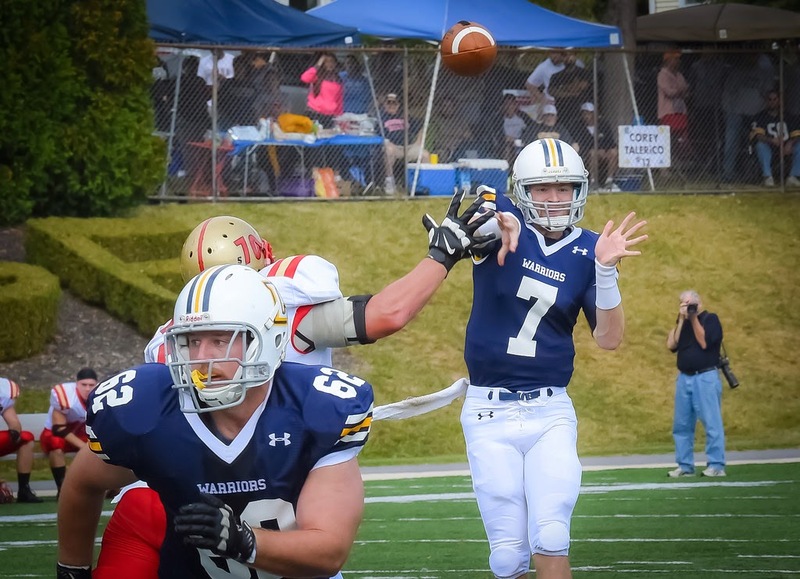 Senior Tyler Jenny (Glasgow, Pa./Glendale) was brilliant, as he crossed 200 yards for the third straight week, completing 19-of-27 passing for 253 yards and two touchdowns, as he dropped passes to a career-high 10 receivers. He was not sacked for the second time in three games. 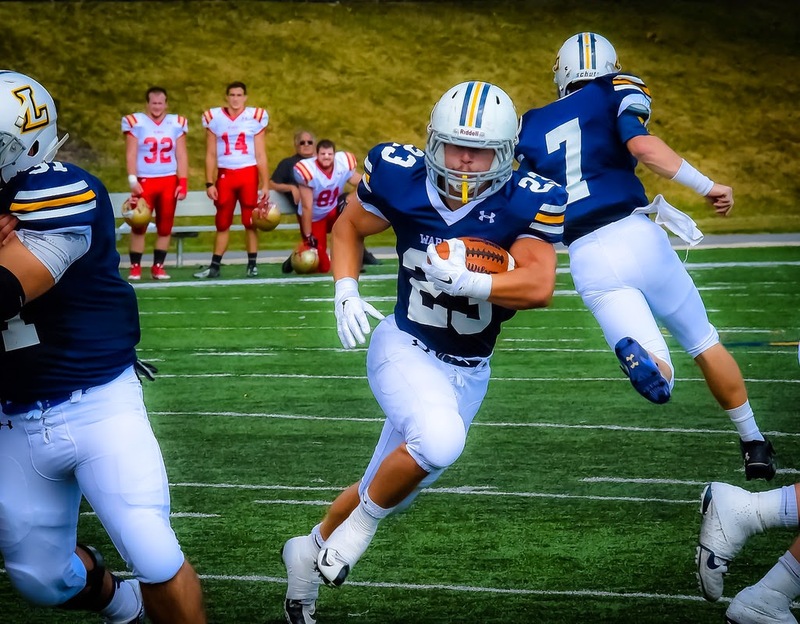 Senior running back Craig Needhammer (Lansdale, Pa./North Penn) finished with 26 carries and 81 yards, while his two scoring runs helped him tie the school record for career touchdowns of 35 set by wide receiver Tim Dumas (1996-99). He also added four yards receiving and 83 yards on kick returns for 168 all-purpose yards, leaving him 552 yards shy of the school record. Defensively, the team allowed 251 yards, but it was able to make several big plays, led by the play of junior Cole Welham (Lewistown, Pa./Lewistown Area), who finished with career highs of 10 tackles, six for a loss and three sacks, as Lycoming notched 11 tackles for loss and five sacks in the game. 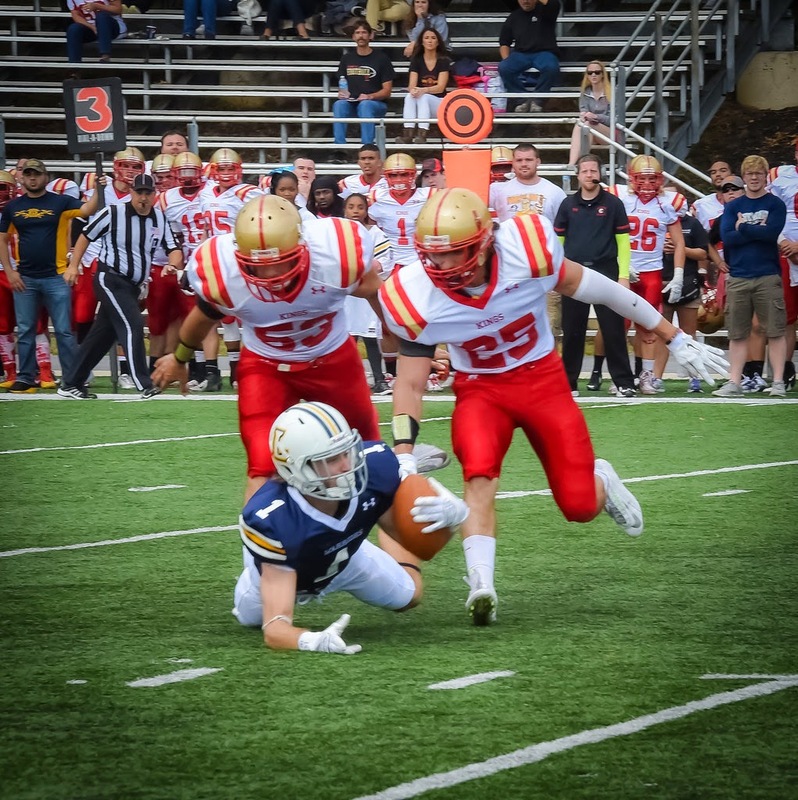 The Warriors (3-0 overall, 2-0 MAC) got their first break midway through the first half when King’s was forced to punt from its 33-yard line, but a muffed snap gave Lycoming the ball at the King’s 22. Three plays later, after a 15-yard pass to senior John Sibel (Yardley, Pa./Pennsbury) and a rush from Needhammer, the running back cruised around the right side and scored from five yards out. King’s looked like it would answer, getting to the five-yard line during a 12-play drive, but the Lycoming defense started to make King’s work backwards, drawing a false start before junior Josh Cook (Hatfield, Pa./North Penn) and sophomore Adin Hines (Harrisburg, Pa./Susquehanna Township) caught King’s running back Kyle McGrath behind the line of scrimmage at the 12-yard line. After an incomplete pass, the Monarchs missed a field goal attempt. Lycoming responded with a seven-play drive, as Jenny hooked up with senior Cam Kriner(Montgomery, Pa./Montgomery) for 34 yards and junior Corey Talerico (Moosic, Pa./Riverside) for 30 yards to get the ball to the four. Three plays later, Jenny found junior Ryan Umpleby (Forest Hill, Md./Fallston) for a three-yard touchdown. King’s cut the lead to 14-7, though, as a reversal on the kickoff return helped Dan Kempa break free and reach the 11-yard line. Four plays later, Patrick Robinson strolled in for the score. It didn’t take Lycoming long to respond, though, with Needhammer returning the ensuing kick to the King’s 38-yard line. Nine plays later, Jenny found junior Pat Whalen (West Chester, Pa./West Chester East) for an eight-yard touchdown pass with 7:41 left in the half. 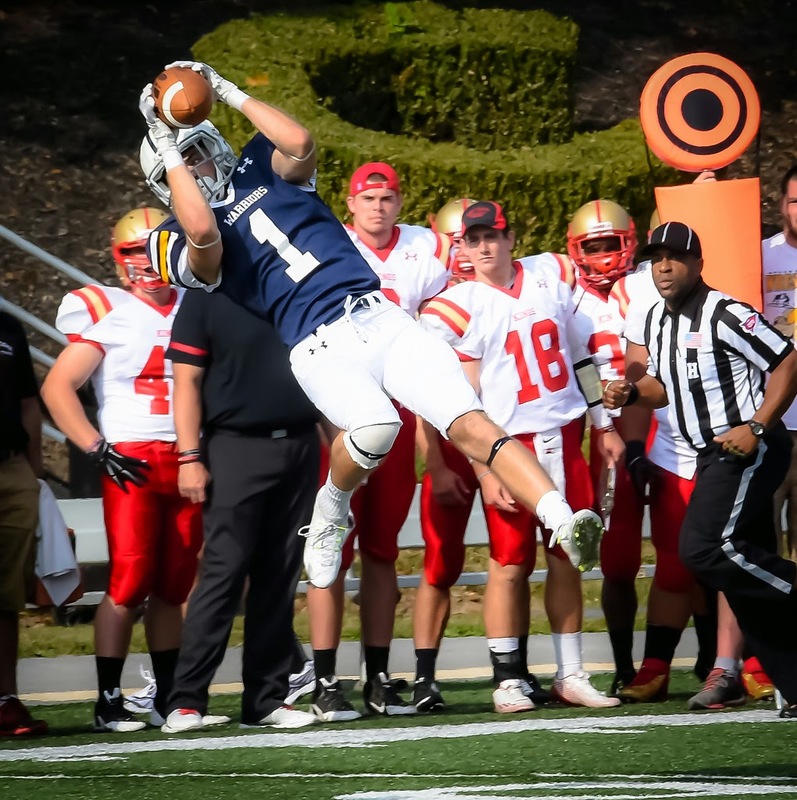 As the half neared a close, Dan Kempa struck again for the Monarchs, catching three passes in row for 40 yards to get the ball to the three-yard line before Mikhail Kniaziewicz hit a 20-yard field goal with 20 seconds left in half, sending Lycoming into the locker room with a 21-10 lead. The Warriors started out the second half by forcing a punt and getting the ball at its own 20-yard line. After a penalty on first down, Jenny rolled out of the pocked and looked downfield, finding Sibel for a 45-yard pass to get the ball to the King’s 40. Six plays later, Needhammer scored his record-tying touchdown from two yard out. King’s got the ball into Lycoming’s half of the field one more, driving to the one-yard line as the fourth-quarter started, but the Warriors again forced the Monarchs backwards, as Welham got in on a four-yard tackle for a loss before a sack pushed King’s into a fourth-and-goal at the 11, where Kniaziewicz hit a 29-yard field goal. 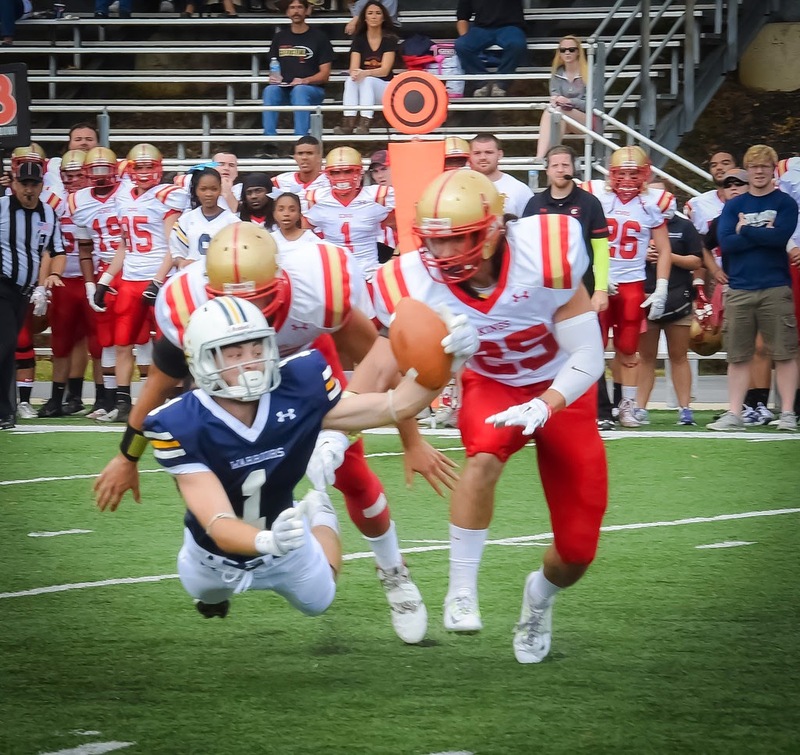 In King’s final two possessions, the Warriors allowed no yards in seven plays, while the Lycoming offense used its running game to grind down the clock, holding the ball for 8:50 in the final quarter. Umpleby led the group of 10 receivers with a catch with five catches for 57 yards and Sibel finished with three catches for 72 yards. Talerico added three catches for 46 yards. 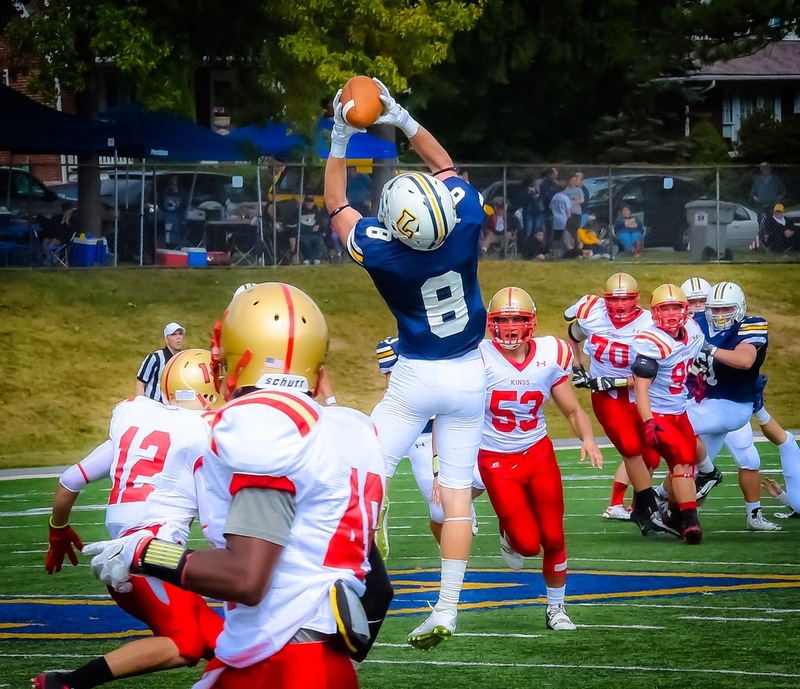 Kempa led the Monarchs, finishing with 10 catches for 131 yards. Tyler Hartranft finished 18-of-37 for 219 yards and he added 11 rushes for 42 yards, but the Monarchs managed just 27 rushes for 32 yards in the game. Junior Matt Malecki (Stevensville, Md./Kent Island) finished with seven tackles for the Warriors, one for a loss, while junior Brian Campbell (Drums, Pa./Hazleton Area) added four stops and a sack and senior Jimmy Nottingham (Hightstown, N.J./Hightstown) added three stops and a sack. Bobby Russell led the Monarchs with 16 tackles and one for loss. Justin Burke notched eight tackls and Kris Matthews posted seven. The Warriors get back on the field on Saturday, Sept. 27, when they head to Middle Atlantic Conference foe Wilkes for a 1 p.m. game.